Just finishing now a refreshing glass of the Jaume Serra Cristalino Cava Brut on the patio, enjoying the sun and the company this beautiful Easter Sunday. This sparkling wine started in mimosas with brunch – light and refreshing – and now sits bubbling in a flute, throwing reflections of the Carolina sun back toward the heavens. It’s a soft, dry white with (obviously) floral notes, a Spanish sparkling wine crafted in the traditional method. Just today I learned that this means secondary fermentation occurs in the bottle itself. Wine & Spirits Magazine has already recognized the performance of the Jaume Serra Cristalino, so it’s no surprise if you arrive at this post more informed of its profile than I am even now. I can say it was affordable and fared well against more expensive champagne to which I would have compared the Jaume Serra Cristalino. We had this sparkling wine with glazed ham, French Toast casserole, and scrambled eggs (with cheese!). Not your typical Sunday and the the Brut stood well in this occasion. We tend to drift more often to big reds in this house but were happy today called for something a little different. 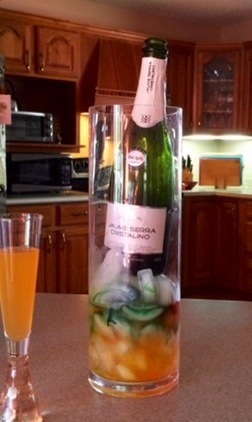 This entry was posted in Prosecco and tagged Spain.